Selections include: The Rocky Road to Dublin Slip Jigs, Drops of Brandy, MacPhee’s Reel Reels, Malcolm Currie, The Cuckoo, The Inver Lasses, Buntata Scatan, The Lark in the Morning Irish Song, John Anderson My Jo 4/4 Lowland tune, Mount Your Baggage Double Hornpipes, Go To Berwick-Johnny, Dan Dheirg Dargo Slow Air, The Laird O’Drumblair Strathspey, Turn the Key and Go Reel, Brian Boru’s Slow Marches, March of the King of Laois, The Galway Races Irish Song , The Keel Row Strathspeys, What Ails Ye?, Orange and Blue, The High Road to Linton Reel, Rattlin’ Roarin’ Willie Scottish Song, The Atholl Highlander Jig, Caber Feidh March, Caber Feidh Strathspey, Caber Feidh Reel, Rakish Paddy Irish Reel, Caber Feidh Scottish Reel, Land o’ the Leal Scottish Song, The Highland Laddie Hornpipes, My Love is But a Lassie Yet, The Rakes of Mallow, Mairi’s Wedding, The Fall of Foyers Slow Air, The Thin Red Line March, Rob Roy MacGregor Strathspey, Cutty Sark Reels, Drowsy Maggie, Erin Go Bragh Scottish Song' Amazing Grace Hymn, The Minstrel Boy March, The Wearing of the Green Irish March, Scotland the Brave Scottish March, The Irish Washerwoman Jigs, Paddy’s Leather Britches, The Kesh Jig, Coffee and Tea Lowland Tune, Wee Totum Fogg Double Hornpipe. Four top musicians blend their talents to produce a unique Christmas recording in traditional Celtic style. Featured are bagpipe virtuoso George Balderose, ragtime guitar legend Ernie Hawkins, Irish tinwhistle master L.E. McCullough, and Jazz keyboard ace T.H. Gillespie. The result-- a warm, gentle garland of yuletide and Celtic tunes guaranteed to drive the winter chill from your door! Selections include : Il Est Ne, God Rest Ye Merry Gentlemen, Good King Wenceslas, Angels We Have Heard on High, We Three Kings, O Come All Ye Faithful, The Christ Child's Lullaby, Da Cold Nights of Winter, Deck the Halls, We Wish You a Merry Christmas, O Little Town of Bethlehem, I Saw Three Ships, Une Flambeau, Jeanette Isabella, Here We Come A-Wassailing, Silent Night, The Wexford Carol, Christmas Eve, Amazing Grace, Greensleeves, Hark! The Herald Angels Sing, Jingle Bells, The First Noel, Joy to the World, St. Stephen's Carol, Drops of Brandy, O Come, O Come Emmanuel, It Came Upon a Midnight Clear, Away in a Manger, Auld Lang Syne. 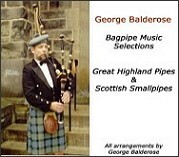 George has recorded more than forty favorite tunes on the Great Highland Pipes and Smallpipes including tunes appropriate for weddings, funerals, birthday celebrations, processionals, and funerals. The selections include:The March of the King of Laois, Believe Me If All Those Endearing Young Charms, Loch Rannoch, Morag of Dunvegan, Amazing Grace, A Mighty Fortress is Our God, Highland Cathedral, All the Way to Galway, Mairi's Wedding, My Faithful Fair One, Scotland the Brave, The Wearing of the Green, Gin I was a Baron's Heir, Comin' Through the Rye, Will Ye Not Come Back Again?, The Rowan Tree, Madame Bonaparte, Jig Medley, Strathspey and Reel Medley, Leaving Lismore, Mary Scot, She Moved Through the Fair, Star of the County Down, Hyferdol, Old Hundredth, We Gather Together, Blessed Be The Tie That Binds, Brother James Air, the Water is Wide, Tis a Gift to be Simple, John Anderson My Jo, Piper's Wedding, and more. 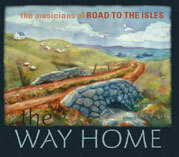 Drawing from a wealth of experience and study, Road to the Isles performs the instrumental music, dance, and folksong traditions of both cultures. Comprising five talented performers representing years of experience in their respective fields, Road to the Isles will take you on a journey to the lochs and glens of the Celtic lands of old. Their performances include the Sword Dance, Highland Fling, Sean Triubhas, Irish reel, and Jig, Irish Slip Jig, and Irish Hornpipe, complemented by songs, stories, and instrumental solos, duets, and trios. The ensemble gives audiences a unique view of the similarities and differences between the music and dance traditions of these fascinating and ancient cultures.